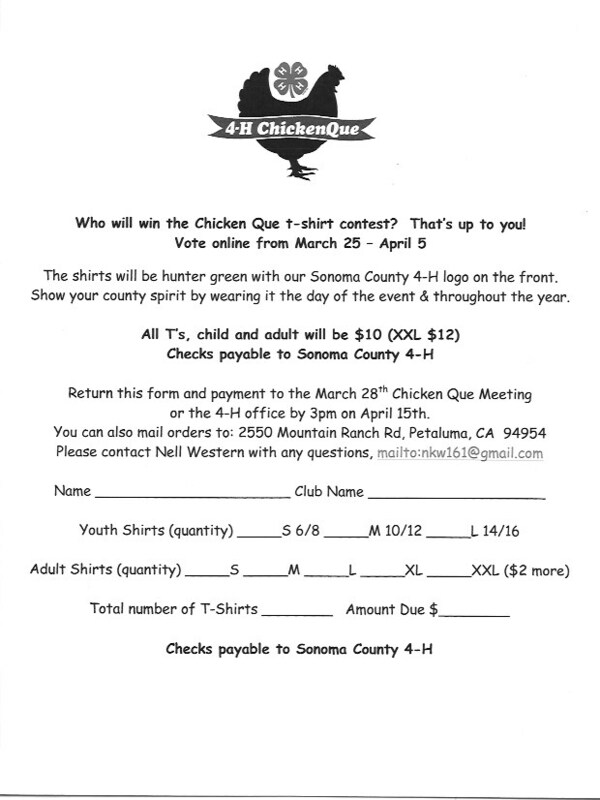 Chickenque is an open house to introduce the 4-H program to members of our community, as well as a fundraiser for the Sonoma County 4-H. For 58 years, 4-H members and their families from all over the county have come together, rain or shine, to host the largest single day chicken BBQ west of the Mississippi! Our 4-H Clubs host interactive booths featuring the many projects their members are involved with. Please come out and be part of this wonderful event, enjoy good company and a good meal! Fun for the whole family! 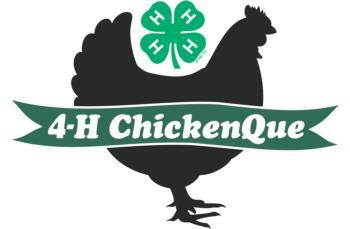 The 4-H Open House & ChickenQue belongs to every 4-H family both past and present. We have worked hard to maintain the essence of the historic event while helping it evolve to meet the demands of today and tomorrow. We started as an annual picnic/BBQ that brought 4-H families and friends across the county together for a day of fun and relaxation. 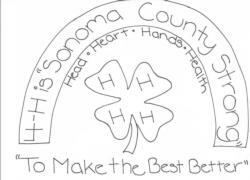 Fast forward: we now have evolved into an event that is an open house that highlights all the wonderful things 4-H in Sonoma County has to offer prospective 4-H’ers and their families! Check out the 2017 chickenque video! Thank you froggy 92.9! 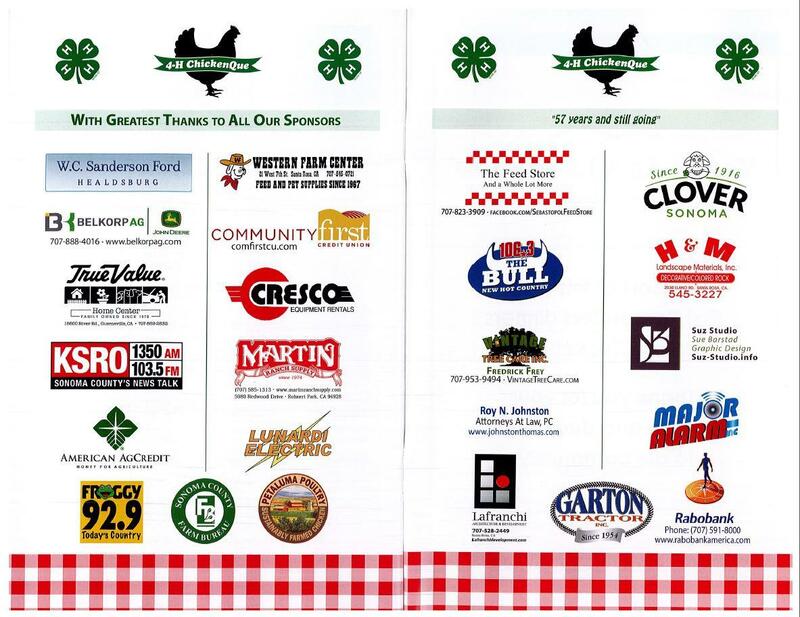 The 4-H Open House & ChickenQue is a great way for clubs to earn rebates for their participation in all of the ChickenQue activities. From cakes to informational booths, see how you can earn money for your club! CQ details- Are you ready? 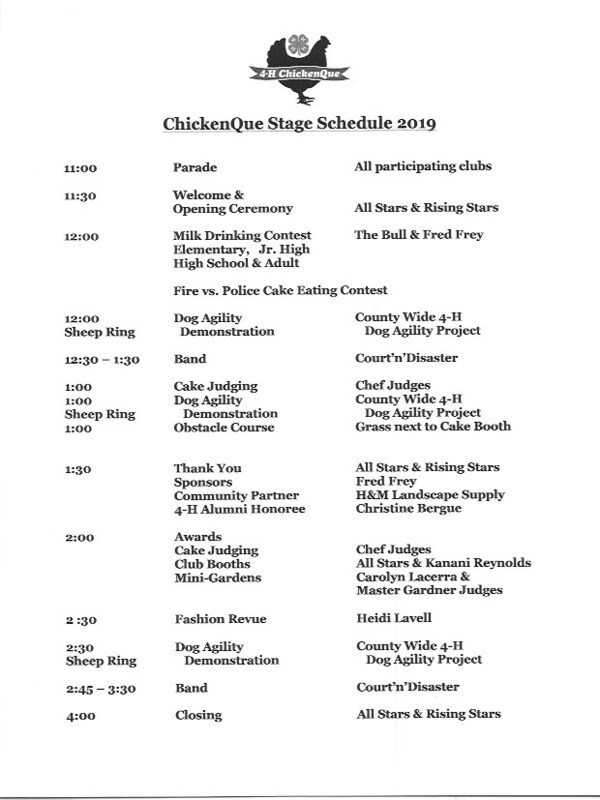 to sign your family members up for work shifts for ChickenQue set-up on Saturday, May 4th and for the ChickenQue on Sunday, May 5th. Please note, you must complete a separate registration for each family member. Volunteer sign in will be at the Livestock Office across the grass from Saralee and Richard's barn next to the Sheep Ring. Make note of your shifts when you register. You must complete a separate registration for each family member. Please be sure to sign up for the correct age category for your child. Signing up in the wrong age category because yours is full means we will contact you to move to another shift. Please understand the shifts listed and volunteers needed are the shifts needed to run a successful event. If you are able, please consider shifts in the BBQ area or clean up shifts in any area. These are historically hard to fill, but have to be done and many hands make light work! Dessert Donation - Each family is responsible for baking a 2-layer cake or 9” pie or 9x13” pan of UNCUT bars/brownies for ChickenQue. You are responsible for delivering and signing in your item. Cake Judging Contest - enter your cake in the cake contest. Prizes awarded at ChickenQue. MUST COMPLETE ENTRY FORM AND FAX OR SCAN AND EMAIL TO TESSA AT THE COUNTY 4H OFFICE NO LATER THAN APRIL 12TH… NO EXCEPTIONS! Open House Club Booth - Promote your club activities by having an activity booth. Application for Club Booth MUST COMPLETE BOOTH APPLICATION AND FAX OR MAIL TO TESSA AT THE COUNTY 4H OFFICE NO LATER THAN APRIL 12TH… NO EXCEPTIONS! Open House Community Booth - This is a great opportunity to showcase your organization. Mini Garden Contest - create a mini garden in a container using the theme "4-H, One Size Fits All". MUST COMPLETE SHEET AND FAX OR SCAN AND EMAIL TO TESSA AT THE COUNTY 4H OFFICE NO LATER THAN APRIL 12TH… NO EXCEPTIONS! Helpful Hints: What does "one size fits all" mean to you?